Thread: 1990 S13 Silvia, OEM style...but not! just wondering, have you got any more info on the rear end lik pics and stuff of the rear gtr hubs n shafts n rear brakes? Haha yeah I AM on every forum Craig, muhahaha! The GTR stuff I might have some pic of back in oz but it's not very exciting to look at. Buy GTR diff, driveshafts and hubs (these are all incompatable with almost anything else, since the GTR driveshafts are bigger and the hubs suit the driveshafts). Remove the input shaft flange and the rear cover from the S13 diff. Fit these parts to the GTR diff. Bolt it all back in. The brakes are unassociated to any of this, people always ask me about hub conversions then start going on about brakes haha. You can do the two separately people! I've always run the S13/14/15 style rear brakes, they were great no reason to change them. 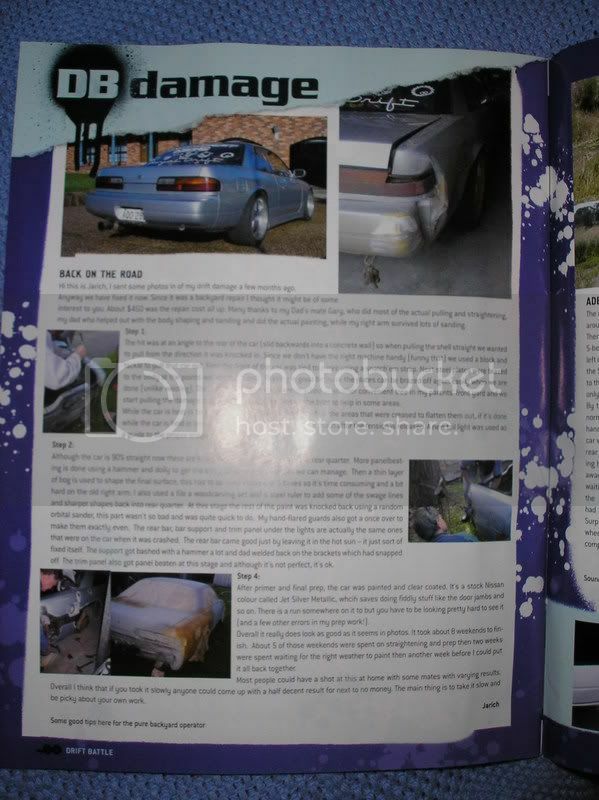 Yup I did a write up in drift battle back in the day . Thanks . Of course alot of the car repair work's credit goes to my dad and his mate. But I'm learning! This is actually the 3rd car I've had a hand in respraying now and I'm in the process of doing parts of a 4th one alone. Learning more each step of the way . spoken to u on ns alot a while back.. hows things... the rig looks great... u still overseas or back in oz??? welcome to jdm as well..
WoW, it's so cool how you fixed everything up soo well!!! CONGRATS for a great car aswell!! Yeah I think it was a combo of not so great financial returns (although i thought it sold quite well for a niche market magazine) and Ben Ellis deciding that running Otomoto was a better idea then making a magazine every month. EDIT: I just remembered that I was going to get the wheels polished up sometime, don't you reckon the PIAA's would look sweet with a fresh polish? They are in good nick but they don't have a super shine like they used to anymore. Either that or I'll replace them with my dream wheel, SSR LM-9. The smallest they make is 18s which is unfortunate but these 18x9 and 18x10 ones that sold recently on Yahoo! would have been perfect.